Atonement is a very good British romance novel by Ian McEwan. Fledgling writer Briony Tallis, as a 13-year-old, irrevocably changes the course of several lives when she accuses her older sister’s lover of a crime he did not commit. Unfortunately the power of the book is in the details and the movie only has 130 minutes to put the story in. It’s obvious this isn’t enough. Small scenes are a bit odd but can’t be left away because the story needs them, but are too short to excite the viewer. What’s the thing with Briony writing plays? The answer is: read the book. 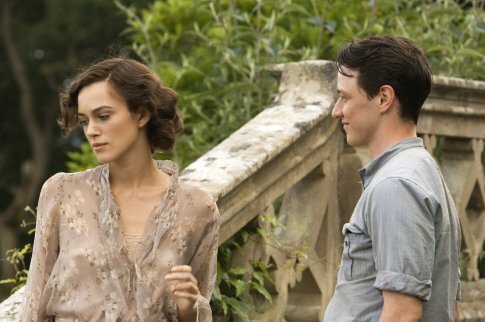 The movie is nice though and Keira Knightley is fabulous. I rate it with a 7.